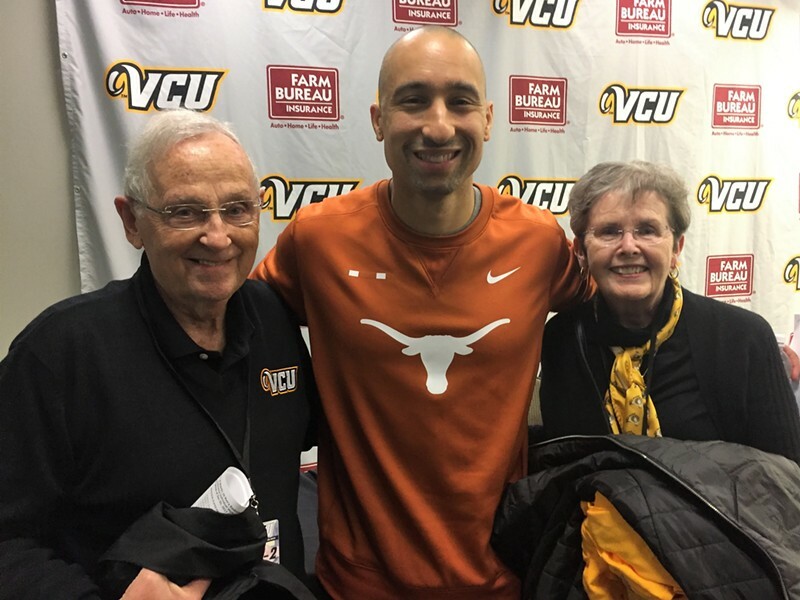 Former President of VCU, Eugene Trani and his wife, Lois, pose with former basketball coach Shaka Smart after Tuesday's highly touted game. On Tuesday, Dec. 5, 2017, in the prime-time bright lights, Virginia Commonwealth University's Siegel Center put its best foot forward with a big-game atmosphere. The back story on the Texas at VCU tilt's two head basketball coaches added an irresistible angle to the matchup. To some observers it was a Shaka Smart vs. Mike Rhoades affair. The history connecting them supports that view. It was the 105th consecutive capacity crowd for the home-standing Rams. Scalpers were said to have been getting $75 and more for tickets. As ESPN2 was in the house, a national television audience also watched the visiting Texas Longhorns build a 19-point lead with 11:59 left in the contest. Then, like magic, the Rams defense became crushing and their shots started falling. For the next few minutes it got as loud as I've ever heard it at the Siegel Center. At the 3:52 mark, VCU seized what would prove to be its only lead in the game: VCU 63, Texas 62. For the next few furious minutes neither team scored. When the burnt orange-clad visitors pulled ahead, again, the home team's goose was cooked. The Longhorns went on to win what was truly a first class college basketball game. Both teams gave it all they had. Final score: Texas 71, VCU 67. After the game, the Terry Sisisky Media Room was jam-packed with sportswriters, broadcasters and certain others who are granted access. Those assembled had to expect this part of the night would be special, too. They weren't wrong. VCU hoops fan Stuart Siegel was there; he frequently is and why not? So were VCU President Emeritus Eugene Trani and his wife, Lois. While the losing coach, Mike Rhoades, answered questions, his former boss, Shaka Smart was still on the gym floor, posing for keepsake pictures with old friends and several former VCU players. As usual, Rhoades did a fine job of handling the postgame ordeal. A few minutes later Smart sat in the hot seat. After praising his friend Rhoades and the VCU team, the winning coach seemed eager to say, "This is a special place to play a basketball game." He also seemed tired. Once Smart was done with answering questions, the reporters and cameramen started to pack up and leave. Trani approached Smart. The two of them had a warm but brief conversation. Rather than hurry out of the room, I snapped a quick shot of them with my cell phone. Trani then asked me to take a photo of the three of them. Naturally, I was happy to document the moment. Looking through the lens at the smiling trio felt like living in a Frank Capra movie. National notes: See Longhorns freshman phenom Mohamed Bamba's monster dunk here. The Washington Post also covered the unusual scene with a nice feature article by Dan Steinberg.